Pressure is mounting on the Canadian government to take a more aggressive approach to curbing its greenhouse gas emissions, following a surprise announcement today of a climate change agreement between the world's two largest polluters. Pressure is mounting on the Canadian government to take a more aggressive approach to curbing its greenhouse gas emissions, following a surprise announcement Wednesday of a climate change agreement between the world's two largest polluters. 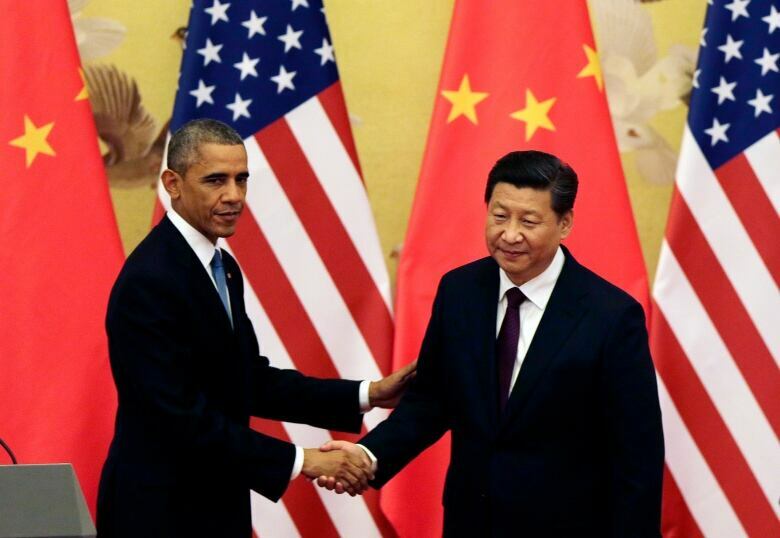 In a stunning announcement that took political leaders and environmentalists by surprise, U.S. President Barack Obama said that his country's GHG emissions would be cut by 26 per cent from 2005 levels by 2025, while China's President Xi Jinping said his country would start capping emissions by 2030 and aim to get 20 per cent of its energy from zero-carbon sources by the same year. "It changes the water on the beans," said David McLaughlin, an adviser at the University of Waterloo’s school of environment, in an interview with CBC News. Prime Minister Stephen Harper and successive environment ministers have repeatedly said Canada would move on climate change when there was a commitment from "all major emitters" to curb greenhouse gas emissions. But Harper has also said that Canada is "more frank" than other countries about the economic impact of mitigating climate change. "No matter what they say, no country is going to take actions that are going to deliberately destroy jobs and growth in their country. 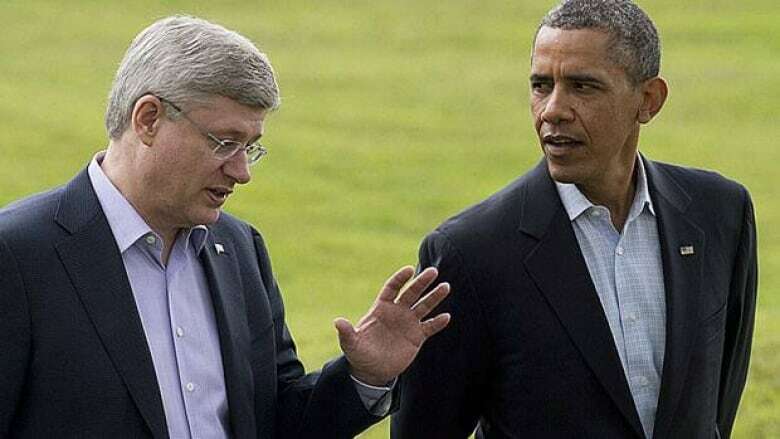 And we are just a little more frank about that, but that is the approach that every country is seeking," Harper said in June. McLaughlin, who is also the former president and CEO of the National Round Table on the Environment and the Economy — an independent advisory group that no longer exists after its funding was slashed by the Harper government in the 2012 budget​ —​ said the U.S.-China deal is a game-changer. "The excuse of the largest emitters not acting is gone. The excuse that the U.S. wasn't moving and therefore we should be careful about how far we move, that is now gone." Chris Severson-Baker, the managing director for the Pembina Institute, agrees. Canada has no excuses left, he told CBC News. "This announcement really removes any excuse whatsoever that Canada can't act until others act, because clearly its biggest competitor and also its biggest consumer of oil is going much further and bringing China along with it." On the bright side, Severson-Baker noted "there is a significant amount of greenhouse gas reduction opportunity available." Alberta Premier Jim Prentice said his province would need to see the details of the agreement, but that on the surface it certainly appeared as "a step forward." "I think the agreement that has been reached between China and the United States has a bearing on the entire international framework," Prentice said in Red Deer on Wednesday. The largest source of greenhouse gas emissions in the country comes from Canada's oil and gas sector, which accounted for 25 per cent of total GHG emissions in 2012. While the Canadian government has taken action to reduce pollutants and emissions in the transportation and electricity sectors, it has yet to announce regulations for the oil and gas sectors — despite a promise to do so by the end of 2012. Wednesday's announcement by the world's two largest economies comes ahead of the 2015 UN climate change conference in Paris. In Canada, the surprise announcement comes ahead of the next federal election set for Oct. 19, 2015. Opposition Leader Tom Mulcair said an NDP government would attend the climate summit to get "Canada back on track." "To hear the Chinese saying they're ready now to discuss constraining limits on their greenhouse gas emissions, that's great news for the world. And Canada should be part of it. We're not," Mulcair said in Toronto on Wednesday. Liberal Leader Justin Trudeau said he hoped an agreement between the world's largest economies would see Harper "wake up" and tackle climate change. "I think it's very clear we have a government that has disengaged from the international climate process, and I certainly hope that Canada will once again get involved in meeting targets and addressing environmental concerns that people around the world have," Trudeau said in Vancouver on Wednesday. Green Party Leader Elizabeth May issued a written statement on Wednesday calling on the Conservatives to "match and exceed" the commitment made by the world's largest polluters. “We need real leadership on climate action, so we must commit to reducing greenhouse gas emissions by 80 per cent below 1990 levels by no later than 2050. I sincerely hope that Canada can become a leader to resolve the climate crisis by example," she said. Environment Minister Leona Aglukkaq was not available for interviews on Wednesday. In a speech to the UN climate summit in New York this September, Aglukkaq said it was "crucial any new agreement contain commitments from all major economies and major emitters." A spokesperson for the prime minister did not directly comment on the agreement between the U.S. and China. "Canada has taken decisive action to reduce emissions, while our economy has grown and over 1.2 million net new jobs have been created since the global downturn," said Stephen Lecce, in an email to CBC News. In U.S. politics, today's deal means Obama could finish his second term in office with a legacy item to show for it. But Republicans were quick to criticize him saying it leaves China off the hook for years to come. "I was particularly distressed by the deal ... which, as I read the agreement, requires the Chinese to do nothing at all for 16 years while these carbon emission regulations are creating havoc in my state and other states around the country," said U.S. Senator Mitch McConnell on Wednesday.